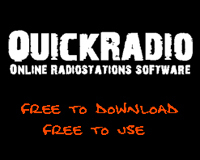 QuickRadio - Free online radiostation software. Listen to your favourite radiostations online! When you find your desired radiostation, click on the station for more detais and for prelistening.